Our expanding selection of Early Lingo Language Learning Programs offers animated and live-action videos that teach children the basic foundation of a foreign language. 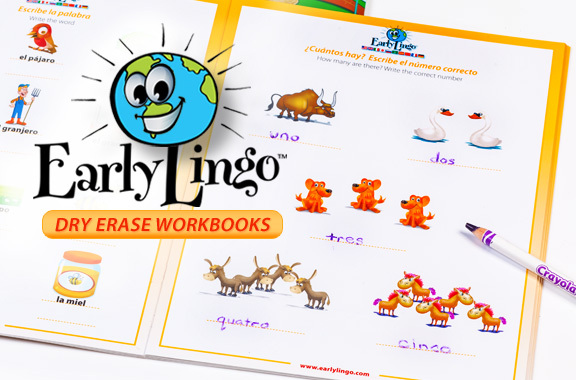 Packed with fun learning tools like: flash cards, Dry Erase Workbooks, downloadable Language Apps and Translation Guides, the Early Lingo Learning System was designed to make learning a new language fun, easy and fast for children ages 0-9 years old. Organized into 6 interactive programs, Early Lingo uses a playful approach to learning with stimulating visual content of everyday activities featuring the lovable animated characters Jojo and Lulu. Currently available in six languages: English, Spanish, French, Italian, Mandarin Chinese and German; with more languages soon to follow. Simply click to view each of the language learning programs in it’s entirety.